For both shoulder and face milling operations. 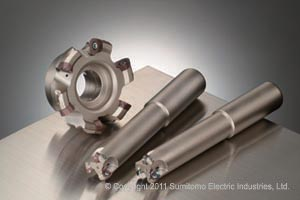 Double-sided, polygonal inserts with 6-corners for high efficiency milling. Cutter body ranges from Dia25mm to Dia200mm. Available Standard, Fine-pitched, Extra-fine pitched and Shank type configurations. Indexable face mill that can be use with 2 different insert geometries. Double-sided, square inserts with 8-corners for high cutting performance. Double-sided, octagonal inserts with 16-corners for better economy. Cutter body ranges from Dia40mm to Dia250mm. 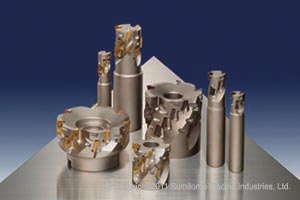 Strong edged, indexable face mill series with 8 cutting edges. 3 cutter body configurations for high feed to large DOC applications. Special chipbreakers available for both Cast Iron and Cast Steel materials. 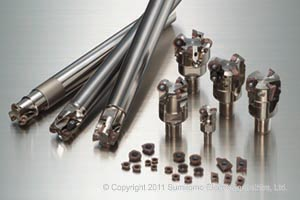 Versatile indexable endmill series with WEX, WRCX and MSX modular heads. 2 types of arbor shanks for tool overhang of up to 6D. Strong edged, versatile, super high feed indexable endmill series. Unique insert shape for extra strength and cutting performance with highly durable cutter bodies. 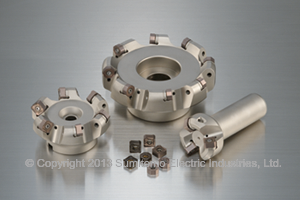 4 insert sizes utilized for cutter diameters ranging from Dia16mm to Dia100mm. 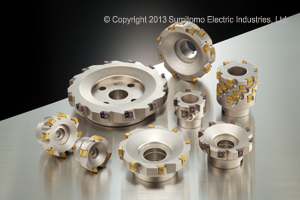 Indexable face mill series with tangentially mounted inserts for extra cutting edge strength. For high efficiency, semi shoulder milling with a max. DOC of 15mm. Cutter body ranges from Dia80mm to Dia200mm. Cutter body with 2-stepped insert configuration for deep shoulder milling. Precision molded inserts with nicked cutting edges for low cutting resistance. Cutter body ranges from Dia80mm to Dia250mm. 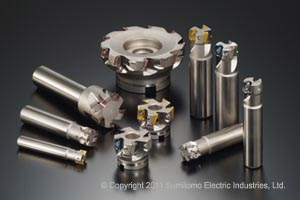 Indexable endmill series with round inserts for exotic alloy machining. Ultra-high rake and high rigidity body design promotes low cutting resistance and low vibrations. 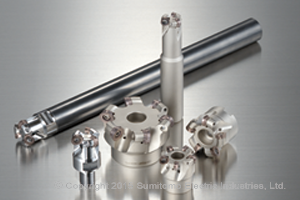 Proprietary insert positioning mechanism increases tool operability and higher accuracy. 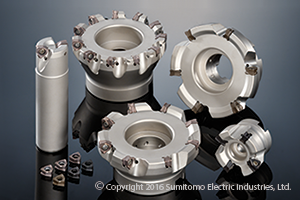 Indexable endmill series for versatile, high efficiency milling of Non-ferrous alloys. High rake insert design coupled with Uncoated H1 or AURORA Coat DL1000 grades. 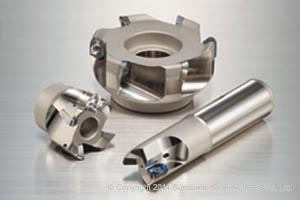 Holders range from Dia20mm to Dia125mm in shank and shell type cutter bodies. Indexable endmill series with precision construction and strong cutting edge design. 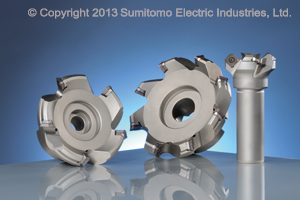 Holders range from Dia14mm to Dia125mm in shank and shell type cutter bodies. 6 types of chipbreakers including the new E and EH types for Stainless Steel machining. 4 cornered square insert for shoulder milling with excellent squareness. High precision construction with optimized insert design for superior machined finish. Available in 2 insert sizes - SOMT0803 and SOMT1204 types. 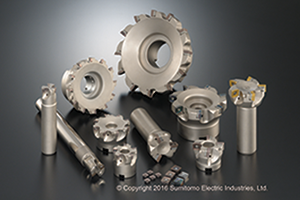 Cutter bodies range from Dia20mm to Dia250mm, in shank and shell types. Improved run-out precision for better machined surface quality. Extra-high rake with special cutting edge configuration for improved edge sharpness. Special FG-chipbreaker designed to greatly reduce burr. Multi-teeth indexable endmill for heavy roughing. Lead groove and special pocket design for smooth chip evacuation. 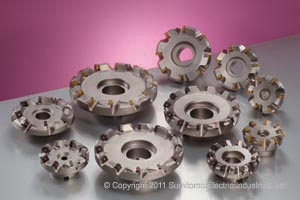 Holders range from Dia20mm to Dia100mm in shank and shell type cutter bodies. Indexable endmill series for a variety of machining applications such as pocketing and ramping. 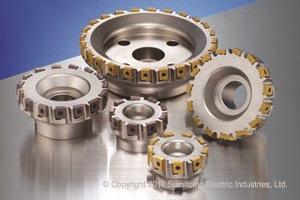 4 insert sizes utilized for cutter diameters ranging from Dia20mm to Dia160mm. 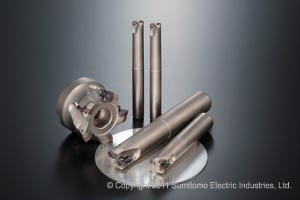 Surfing inserts for anti-vibration, rough milling and a special chipbreaker for Aluminum alloys.